A spectacular revelation from the usual pieces, this fabulous creation of our brand features the Gold Lock Coin done skillfully and uniquely in pure brass and gold plating. The sensual piece is further adorned beautifully with the powerful wealth images, symbols, words and deity. Empowering the coin are two magical taoist incantations of igniting wealth power, providing a special channel to the cosmic realm to invoke divine blessings for maximum riches. Inspired by the need to activate its true potential and power, a shy energy infused tag is hidden under an exquisite pendant of the mystic knot. Stunningly elegant, this coin promises you the millionaire temptation, generate financial success, enable you to earn higher incomes and build greater fortunes. The coin also constitute a prestigious gift. This explosive wealth galvanizer can propel millions into your bank account. It attracts money, bountiful amounts of money, multiplying, duplicating, replenishing itself, infinite money, recreating money effortlessly where money rush to you. It opens up endless possibilities, superlative success, overflowing abundance and initiate the journey to riches. Infinite money awaits you each day and endless opportunities and blessings will come your way. Money accelerates to you explosively and rapidly. The lock will then enable infinite money earned, saved, invested, exponentially multiplied without being lost. The end result will be abundance embracing you. It is a fortune multiplier for laymen, investors, speculators, businessmen and even career minded people who wish to become millionaires overnight. The type of wealth invited refers to both mainstream income (your business/career) and irregular income (investments/real estate/side income). This coin will also magnifies speculative affairs such as lotteries, 4-digits, football bets, horse racing and the stock market. Place this coin together with your investment folder, share certificates or gambling tickets to bring maximum opportunities of winning or striking large gains. It is recommended to be displayed at the southeast corner, your personal sheng chi direction, wealth corners and at your home's main or bedroom doorknobs. 1. Lock Coin - the lock shape initiates locking up of the money that has been made so that one can save it for a lifetime. It has a very powerful chinese character that has hidden meanings of a special 4-worded sentence. It reads "wong karm man liong" in one breathe which means "ten thousand tahil of pure gold". In ancient times, only the royal families, officials and tycoons were able to possess this much of gold! Today, this is equivalent to millions or even billions. 2. The Mystic Knot - is the most influential symbol in Period 8 (2004-2024). The infinite patterns of this symbol will have the influence of this lucky symbol multiplied infinitely, thus enjoy extra good fortune. It will also multiply your health luck, wealth luck, relationship luck and fortune in all areas of your life throughout the Period 8. It is also the best symbol of protection in Period 8 against accidents and misfortune. 3. Treasure Wealth Vase - the treasure vase is a vase of inexhaustible treasures regularly employed for increasing wealth and spreading abundance. a. Change ones luck to positive. c. Blesses one with safety. d. Blesses one with promotion luck. 4. The Two Secret Taoist Incantations - are borrowed from the powerful taoist lineage: "ming chai" (money earned from work) and "ngam chai" (windfall). They will bring better mainstream income as well as windfall luck in investment, speculative portfolios and gambling. They ensures that all your money desires are being fulfilled rapidly! 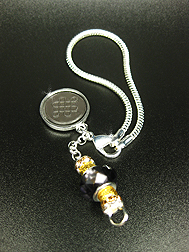 This amulet is flamboyantly strung with exclusively priced and "purple cut bead", gold plated beads, flexible silver rope and genuine swarovski crystals. Genuine 925 silver plated metal string. Improved metal string now comes openable with a clasp to ease the hanging of your amulet; Energy infused with Scalar tag. This part can be removed conveniently from the leading piece if one wishes to onlycarry along the leading piece. 4. Place the coin together with your lottery tickets, share certificates etc to increase chances of getting good gains. 5. Those who are conducting sales or business can display this coin at your cash register.